We do not usually go to a hotel restaurant to check out the local cuisine. There are some exceptions and one of them would be the Bistro Amarillo of Hotel Salcedo de Vigan. Bistro Amarillo puts the Ilocano cuisine front and center. I tried several of their dishes and I came out enlightened. I have been to many hotels and normally their restaurants are not the best places to start a local food adventure. Typically, hotels offer a good selection of dishes from popular cuisines like American, Italian, Japanese, Chinese, Korean, and even Indian. Filipino ? Local? It rarely happens. It probably happens on special days but not every day. 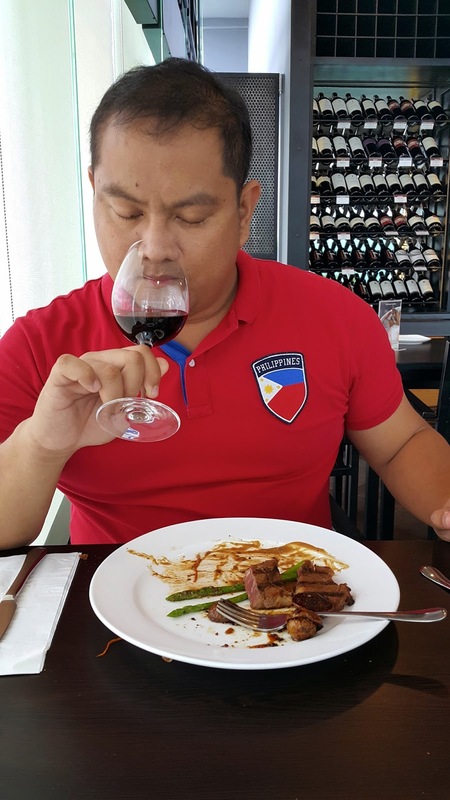 The most high-end hotels here in Cebu are not really into promoting local dishes except probably the Filipino buffet in Shangri-La or St. Mark Hotel's Buffet. Hotel restaurants are deemed very expensive by tourists which make it impractical for a "food trip". Well, Bistro Amarillo is different. The highlight of their restaurant is the menu featuring local dishes that people of Vigan enjoy. The list is quite long. Fortunately, I got company when I went to Vigan that I was able to order many dishes that piqued my interest. "Healthy green vegetables with sweet potatoes and grilled fish that the whole family would love"It was my first time to encounter this dish. I cannot even pronounce it properly at first. 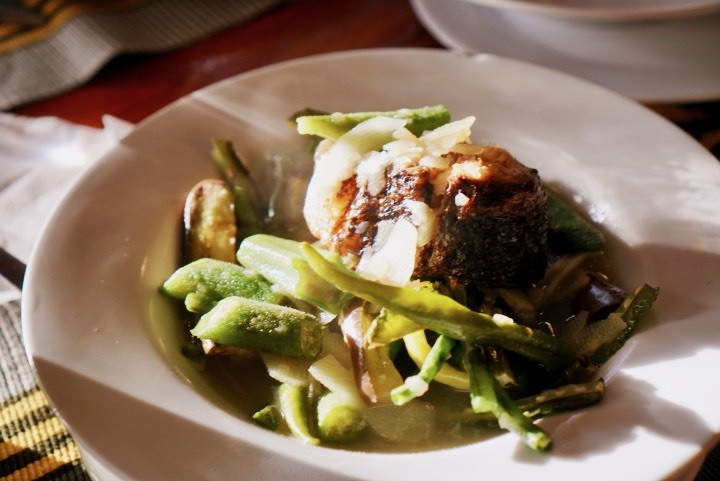 It is a nutritious mix of local veggies topped with bangus or milkfish. 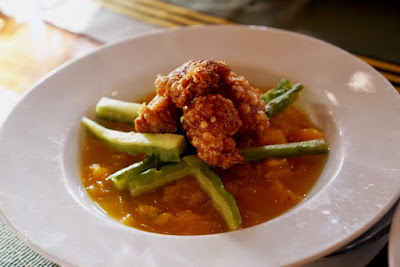 "Mashed pumpkin with sliced bitter gourd topped with Vigan Bagnet. 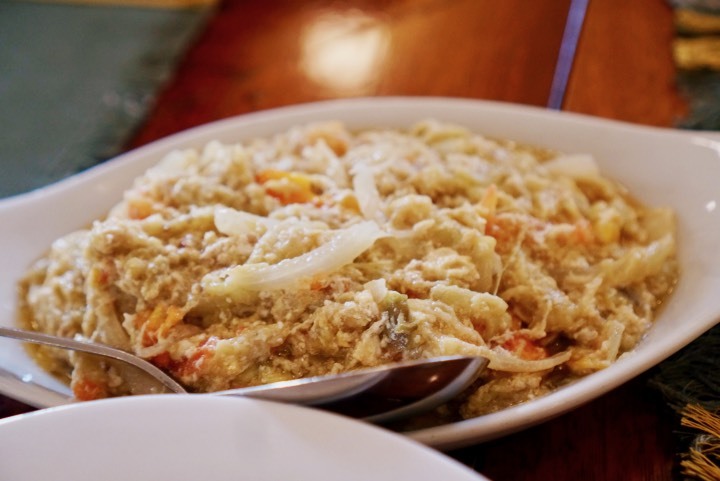 "This is another dish that I never heard of but this is quite familiar because I have eaten several mashed "kalabasa" dishes. It was my first time to eat "squashed squash" with ampalaya although the pair is in the popular pinakbet. "Soft and tasteful mashed grilled eggplant sauteed with onion, tomato and scrambled eggs. "We always have tortang talong at home but poqui-poqui is just done differently. The texture is different and it is like a hybrid of tortang talong and ensaladang talong. 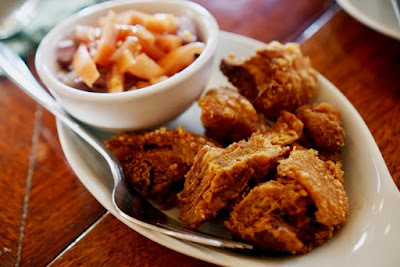 In Cebu, Isidra Comfort Cantina is the only restaurant that serves this Ilocano creation. "World renowned Ilocano vegetable dish topped with Special Vigan Bagnet"This dish is served all over the country but the Ilocano version is the original and the best. The pinakbet was extra special because they topped it with some sinfully good bagnet. 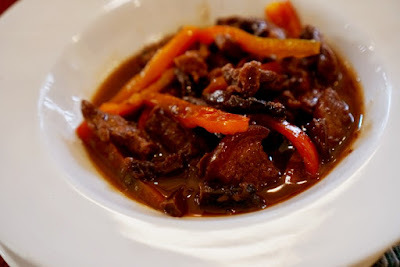 "A popular Ilocano delicacy with fatty pork loin and pork liver cooked with red bell pepper and peas, in a salty-sour sauce"I always get curious when there is a dish that involves innards like liver. Igado is indeed an offal lover's favorite. "Try the delicious taste of Vigan longganisa with Ilocano vinegar perfect for your taste"Vigan's Longganisa is not as fatty as the Cebuano chorizo. It is compact, lean and flavorful. It is best served on breakfast.... all-day breakfast, I mean. "Deep fried large chunks of pork belly served with KBL, perfect for your taste! 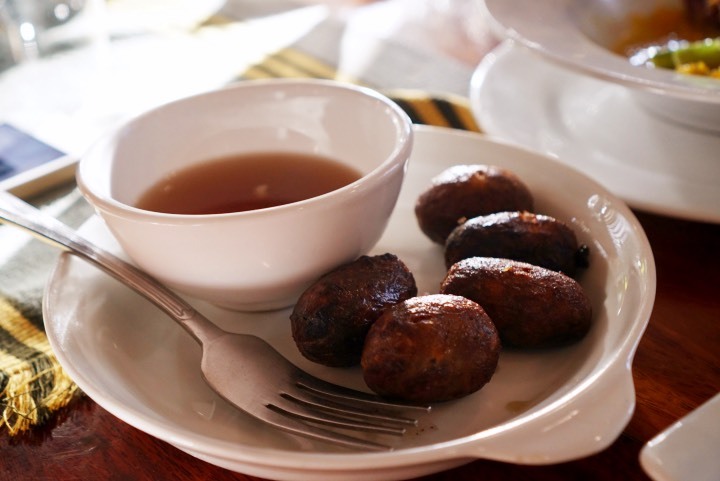 "When it comes to crispy pork, I just usually put vinegar with soy sauce and chili pepper on it. Ilocanos use a different dip for it. They call it KBL. It is not the old dominant party called Kilusang Bagong Lipunan but it is made of Kamatis, Bagoong, and Lasona. Lasona is the purple-colored spring onions. The combo just makes you order more rice. I declare my love for Ilocano cuisine. I am impressed with the diversity of their cuisine. They sure love pork like Cebuanos do but they also have many dishes that use vegetables. My mom is on a restrictive diet and she was able to enjoy many Ilocano dishes. 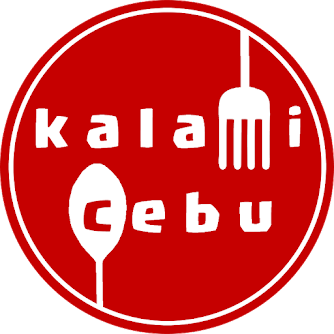 Eating there made me crave for veggie dishes here in Cebu. 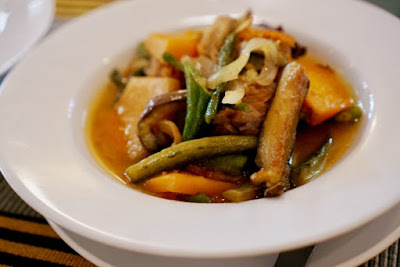 I am really on a lookout now for "authentic" Visayan vegetable dishes. 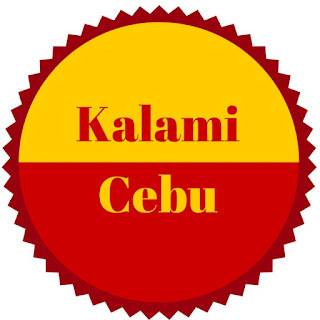 I know it's out there and I would seek it and feature those here in Kalami Cebu. 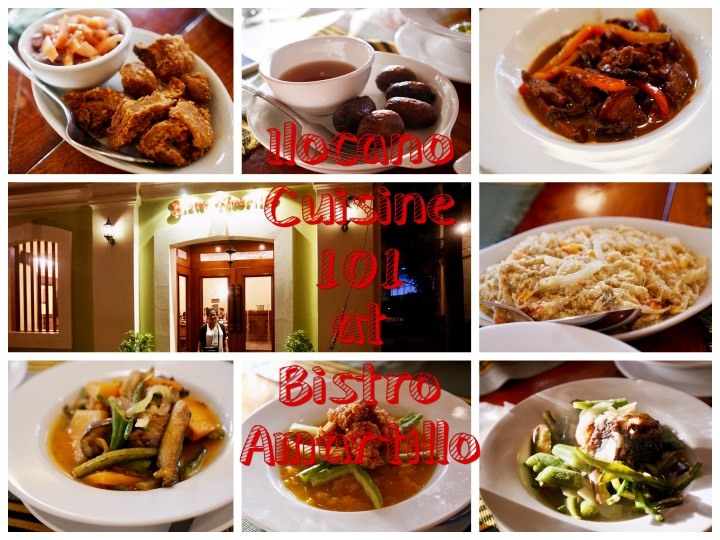 Bistro Amarillo definitely earns a Kalami Cebu "Seal of Approval" for its Ilocano dishes. Can you imagine eating authentic local dishes at your hotel which is just a block away from Calle Crisologo? Add to that, the dishes are just priced less than 200 pesos each. 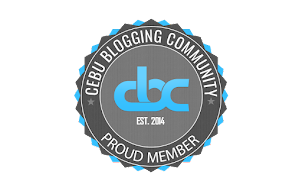 This restaurant is highly recommended by this blog. #TheSustainable Diner Series: Why do we need to Eat Local Food and Promote it in Social Media?